A complex number is a number that can be expressed in the form a + bi, where a and b are real numbers and i is the imaginary unit, satisfying the equation i^2 = −1. 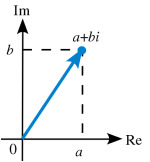 In this expression, a is called the real part and b is the imaginary part of the complex number. A complex number can be visually represented as a pair of numbers (a, b) forming a vector on a diagram called an Argand diagram, representing the complex plane. "Re" is the real axis, "Im" is the imaginary axis, and i is the imaginary unit which satisfies i^2 = −1.